A speedy procedure is most important to solve a crime. 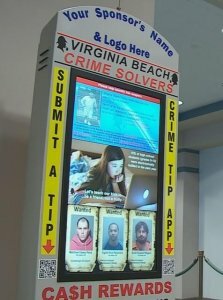 So, to speed up the process and help people report crimes, Virginia Beach Crime Solvers is opening “Crime Kiosks”. Crime Solvers opened the first kiosk in September 2018 at the Courthouse. They have finished installing kiosks at all Virginia Beach area Walmarts. What do the kiosks do? “It’s the modern-day wanted poster. We have information on unsolved crime. We have information on wanted persons who may have skipped bond or have just missed court. And it’s important that police be able to locate these folks.”— Kathy Hieatt, Board Member, Virginia Beach Crime Solvers Board. Kiosks allow people to send anonymous tips about crime. They can do it with a QR Code present on the kiosk screen. 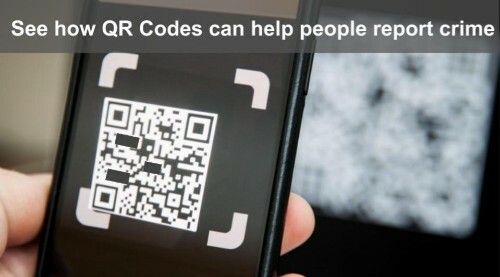 First, people can scan the QR Code on their smartphone and then they can submit a tip after they download the P3 app. In some cases, people who anonymously submit the information, might earn cash rewards. Six kiosks were installed in the area in Sep 2018: Courthouse, Red Mill, Hilltop, Phoenix Drive, Town Center, and Salem Crossing Walmart locations. As the world is progressing, crimes are advancing too. And Police across the world are taking steps to curb them. Hopefully, this initiative by Virginia Beach Crime Solvers will help the city address them well. Also see what other steps are City administrations taking to make their cities safe and secure.